I am very excited to announce the launch of a new T-shirt - I believe the first one I made in 8 years or so. 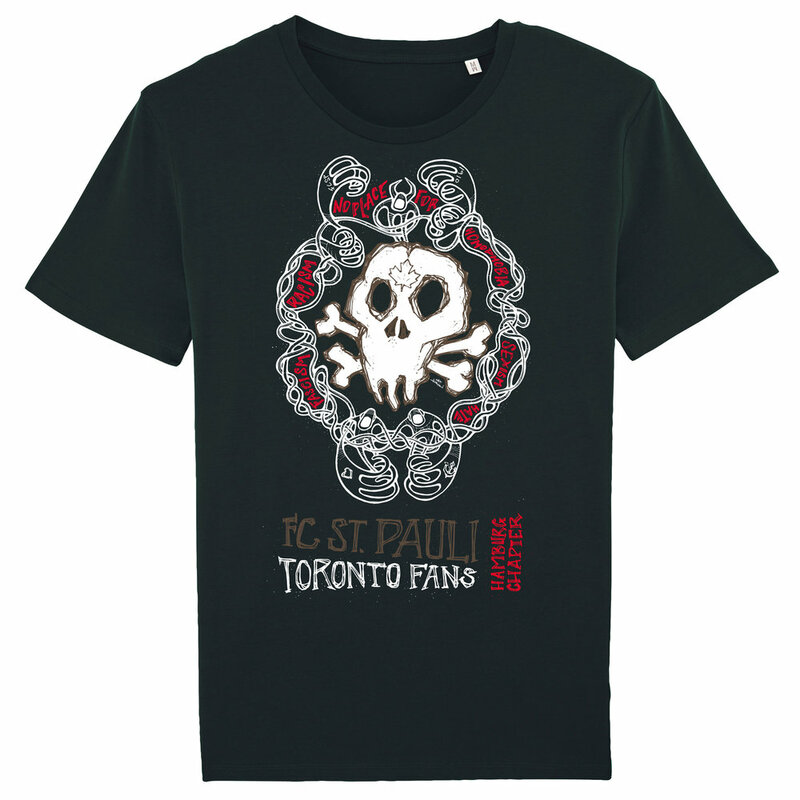 And what a special one: This T-shirt marks the official launch of the 'Hamburg Chapter' of FC St. Pauli Toronto Fans, a Canadian Fanclub of the FS St. Pauli. Why oh why? Well, it is a longer story, It began with Melvin living in Toronto for a while back in 2016. He wanted to watch the games of our team, so he found the Fanclub run by Mark & Mari Palmer, and they watched the matches together at a bar with a bunch of other Sankt Pauli fans. When I visited my son in Toronto I also was infected by the friendliness and hospitality of these wonderful Canadian supporters, and after a while we planned to launch an informal Chapter of the club in Hamburg. Just because we can and because it embraces the barrier- and border-free mentality of St. Pauli Fans. More about this on their website. Now, we'll launch this Chapter. And I made this T-shirt for it. And it can be pre-ordered now in the heliumcowboy online-store. A portion of the sales will go towards a children’s art project we are launching this year together with charity Clubkinder e.V. from Hamburg. Neither the artist nor the gallery will make any profit from this product. 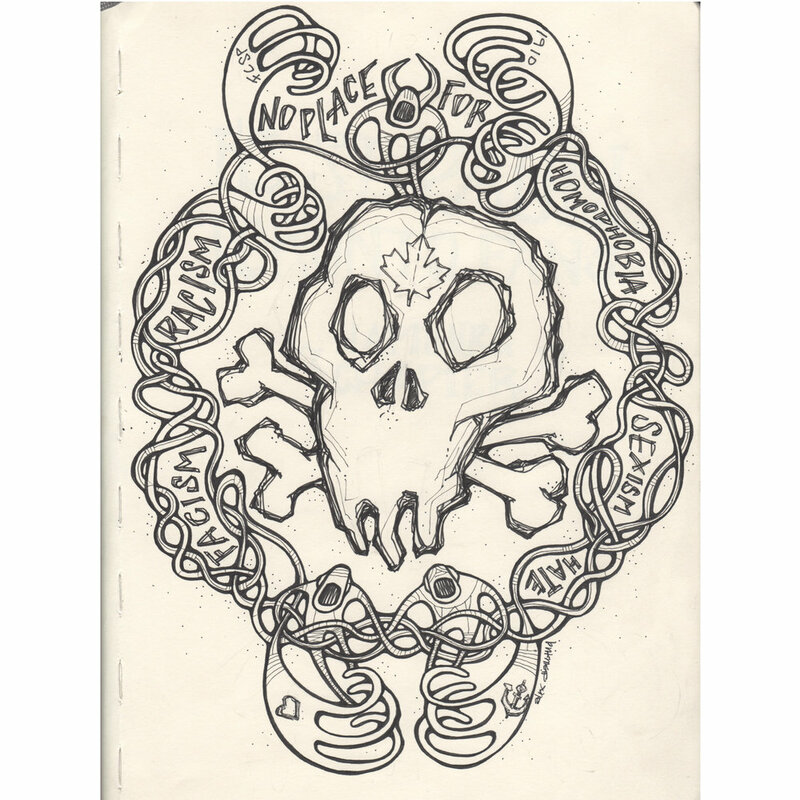 The very typical Alex Diamond-characters that organically embrace the skull and the wording are a symbol for the friendship and connection amongst Sankt Pauli supporters wherever you are in the world. These characters are a part of my artwork for at least as long as my 20-year long membership with the FCSP, and choosing to include the political and social statement that was also on the first T-shirt I was given by Mark Palmer, the founder of the Toronto Fanclub in Canada 2019 was highly important to me - now more than ever in these troubled times. I know that a T-shirt or a sticker will not make the world a better place, but it can spread the word and show our resistance, and you cannot repeat enough that this world is no place for homophobia, fascism, sexism, racism or hate. Not now, nor ever. 'The mud the blood and the beer' - my T-shirt design for Hamburg based craft brewery Kehrwieder Kreativbrauerei is available online (click image to visit the online store). Those of you who know me most likely are aware of the fact that I have been a fiery advocate for the return of great beer in Germany for a very, very long time. Well, it is happening. What has been aptly labeled as the "Craft Beer Revolution" is in full effect in our country, and I feel privileged to seeing it grow close up from the early beginnings over the past few years. By now there are many great new brewers and breweries and superb craft beers in Germany. And more will come. However, my favorite brewery is my friend's Oliver Wesseloh's Kehrwieder Kreativbrauerei from Hamburg. A lot has been said and published about Olli and his amazing beer, and you can get a glimpse of the praise and attention that the "World Champion of Beer Sommeliers" has been getting lately by visiting the brewmasters' website - or simply google him. He makes sensational beer and taught me many things about my preferred drink. I am extremely proud that I have been asked to design one of the two very first Kehrwieder Kreativbrauerei T-shirts. My design is paying tribute to great beer and some of the coarser circumstances that we like to drink it under, and quotes an all-time favorite Johnny Cash song: 'A boy named Sue'. Maybe a bit hard to read in its (late) 60ies inspired colors and the hand drawn type, the text on the front says "The mud the blood and the beer" - a line from the song. Support the Craft Beer revolution and go get yours, this first edition is pretty rare! There is a limited amount of shirts available at the heliumcowboy online store, but you can also order them via the Kehrwieder Brewery website if the shop should run out of your size. Klaas Twiemeyer wearing his T-shirt for Kehrwieder Brewery. Also available at their website. PS: The second Kehrwieder-shirt has been designed by Klaas Twietmeyer (formvermittlung.de), is at least as beautiful as mine and also available at the Kehrwieder website. The shirts are printed by dreihundertprozent.de on fair traded and ecologically correctly grown 100% cotton.